John M. Henderson obtained the Diploma in Mining Engineering at the Koenigliche Bergakademie (Royal School of Mines) in Freiberg, Sachsen, Germany, in 1894. The next year he was awarded the degree Doctor of Philosophy (PhD) by the University of Jena, Germany. His thesis, "Der Glimmersyenit von Rothschoenberg bei Deutschenborn im Koenigreich Sachsen...", was published in the Zeitschrift der Deutschen geologischen Gesellschaft (1895). He came to South Africa in 1896, but the next year went to the United States where he became manager of a gold mine in Colorado and worked on the Dallas oil fields in Wyoming. He later did geological work on the oil fields in Colombia and Venezuela, and among others became acting manager of the Panama Corporation. In the Middle East he investigated oil occurrences in various countries. 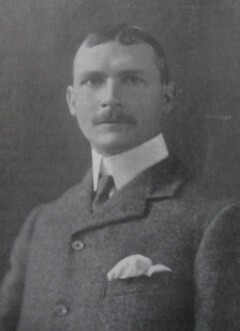 Henderson returned to South Africa in 1903 and settled in Johannesburg. From 1904 he was consulting engineer to Henderson's Consolidated Corporation and its subsidiary mining companies. During his two periods in South Africa he worked on the Witwatersrand as a mine surveyor and sampler and was involved in a variety of enterprises: exploratory drilling for gold on both the eastern and western extensions of the central Witwatersrand; the search for both placer and vein gold deposits in the eastern Transvaal (Mpumalanga); exploration for and development of coal deposits in the Transvaal and Swaziland; investigating the economic viability of platinum, silver, base metal and mineral occurrences in the Transvaal; and exploratory work along the west coast of Madagascar. He became a member of the Geological Society of South Africa in 1903 and during the next six years participated in the discussion of a variety of papers by others. He also produced three papers of his own that were published in the society's Transactions: "New facts bearing on the extension of the Main Reef eastwards" (1905); "Petrographical note on the Kimberley slates in the Eastern Rand" (1907); and "Note on some rocks in the volcanic series of the Karroo System in the Lebombo Mountains" (1909). After serving as honorary secratary and honorary editor of the society in 1908 he was elected president for 1909 and reviewed South African geological work in his presidential address. By 1906 Henderson had become a member of the South African Association for the Advancement of Science, and he became a member of the Royal Society of South Africa shortly after its formation in 1908. He was a Life Fellow of the Geological Society of London, a Fellow of the Geographical Society (London), and a member of the Institution of Mining and Metallurgy (London), the Chemical, Metallurgical and Mining Society of South Africa (serving as its president for 1930/1), and the South African Association of Engineers. In 1914 and 1919 Henderson's address was listed as Springfield, Oregon, United States. Although he made no significant contributions to South African geology after 1909 he appears to have spent most of his time in the country. He presented a collection of surface quartzites from German South West Africa (now Namibia) to the South African Museum in 1911. In December 1924 he was co-author, with Harry Rusden, of a short article, "The story of osmiridium on the Rand", published in the Round Robin and as a pamphlet in Johannesburg. Osmiridium was by that time regularly recovered by the gold mines. In 1930 he participated in the discussion of a paper on the microscopical investigation of coal, read before the Chemical, Metallurgical and Mining Society of South Africa. In 1937 he was elected an honorary member of the Geological Society of South Africa. He was married to Mary Campbell Henderson, born Train. Anhaeusser, C.R. (Ed.) A century of geological endeavour in southern Africa, 1895-1995 (pp. 15, 20-21, 118, 121). Johannesburg: Geological Society of South Africa, 1997. Geological Society of South Africa. Proceedings, 1915, Vol. 18, p. xiii-xix and 1920, Vol. 23, p. xii-xvi: Past presidents, Past secretaries, and Lists of members; Transactions, 1906, Vol. 10: List of members. National Automated Archival Information Retrieval System (NAAIRS). http://www.national.archives.gov.za/naairs.htm Documents relating to John McClelland Henderson. Royal Society of South Africa. Transactions, 1908-1910, Vol. 1: List of fellows and members. Union of South Africa. Report of the South African Museum, 1911.